Two axes and a bunch of flint stones dating back to the prehistoric period were discovered during excavation works in and around Aydos Castle, located on the Asian side of Istanbul in Turkey. The historical findings revealed that the castle had not been used only during the Byzantine period, as it was thought before. 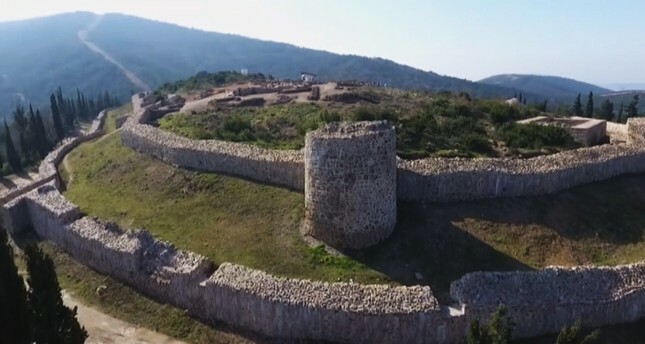 There might have been a settlement around the castle or the surrounding areas in previous periods, the head of Istanbul Archeology Museums Zeynep Kızıltan said. The excavation works in Aydos Castle, which consists of an area of approximately 26 to 27,000 square meters, have been carried out since 2016. The remains of a church and a small chapel were also discovered during the excavations. The historical worth of the site is expected to attract the attention of thousands of tourists, said Hüseyin Keskin, the mayor of Istanbul's Sultanbeyli district. "The restoration of the castle has already been completed, but excavation works are still ongoing," he added. Prehistory is the period of human activity between the use of the first stone tools circa 3.3 million years ago and the invention of writing systems, the earliest of which appeared around 5,300 years ago.